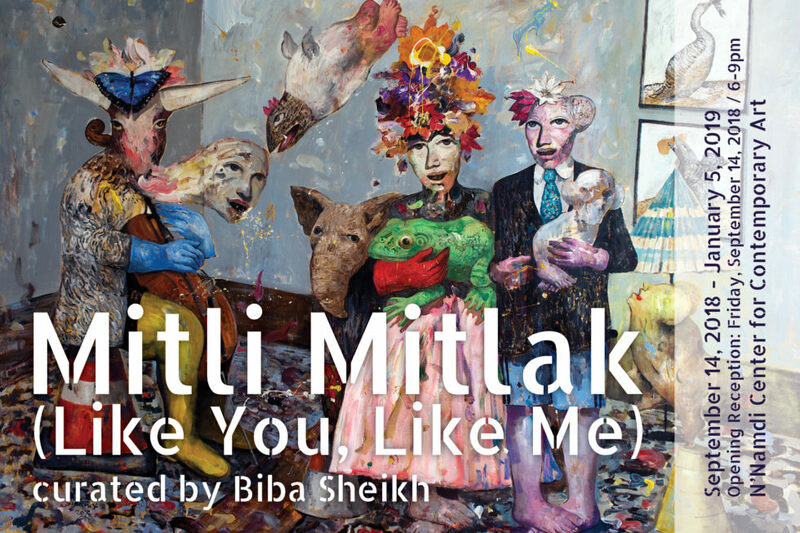 The artists of Mitli Mitlak (Like you, Like Me) communicate through a variety of media delivering messages rich in thematic subjects. One theme that dominates the refugee experience, that of landscape arrives on canvas where architecture, political apparatuses and history are dismantled with the destructive revelry of a toddler. The theme of landscape is revisited by several participants with such concerns as the constant metamorphosis of social structure, moving boundaries between capitalism and culture, war, and the facets of the human psyche. The artists of this exhibition, many of whom are current residents of occupied territories and refugee camps, include: Hani Alqam (Jordan), Thameur Mejri (Tunisia), Sinan Hussein (Iraq), Taghlib Oweis (Jordan), Wael Darweish (Egypt), Ahmed Nagy (Egypt), Klaudja Sulaj (Albania), Luca Paleocrassas (Greece), Manal Kortam (Lebanon), Abbas Yousif (Bahrain), Basel Uraiqat (Jordan), Mohammed Al Hawajri (Palestine), Haitham Khatib (Syria), May Murad (Palestine), Hassan Meer (Oman). All have been given a voice through this Detroit-based endeavor. In Mitli Mitlak (Like you, Like Me), we witness how their situations reverberate with refugees world-wide.